Your Art Gallery (YAG) collaborated with renowned photographer Peter Guttman and his alma mater, Binghamton University, to curate a collection of the artist’s work for an exhibit at the university on view from Thursday, January 25 through Thursday, March 1, 2018. Peter Guttman's work is internationally recognized for a reason… it’s amazing. And the exhibit itself is a beautiful work of art. Guttman, an internationally recognized photographer and travel journalist, graduated from Binghamton University in 1976. Throughout his career, he’s won numerous awards, including the Walter Cronkite Award for Excellence in Exploration and Storytelling, the Lowell Thomas Travel Journalist of the Year Award, and a Lifetime Achievement Award from the New York Travel Writers Society. He also developed a bestselling travel app, Beautiful Planet HD, dubbed one of ‘eight outstanding educational apps’ by NBC News. The exhibit includes: A visual projection display of images from Guttman’s app, Beautiful Planet; a recreation of Guttman’s living room, which has become well-known for its unconventional interior design; and a concert at the exhibit’s closing featuring original music composed by university music students and inspired by Guttman’s photographs. 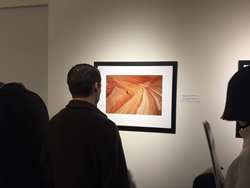 YourArtGallery, a subsidiary of Duggal Visual Solutions, helped make the exhibit possible by working with Guttman and Binghamton University to prepare the photographic works and other pieces for the display at a reasonable cost. YourArtGallery is the ‘World’s first online gallery of its kind’ and markets a range of digital imagery and photographic art from world renowned photographers like Peter Guttman, amateurs, and those of every experience level in-between. The Your Art Gallery team believes every artist should have the gallery experience of displaying and selling their work. Unlike traditional galleries, YourArtGallery does not prejudge its artists’ work. Any artist can promote and sell their work on YourArtGallery.com, and they earn 90% of the royalties. For more information, contact: Danielle Albertz danielle(at)duggal(dot)com.